The Search for the Ten Accomplished Youth Organizations is all about finding, recognizing, and rewarding efforts of barkadas and youth groups in the country who have implemented programs and projects through collaboration and bayanihan with the aim of building engaged and inclusive communities. This year's Search is organized by the TAYO Awards Foundation, Office of Senator Bam Aquino, Office of Senator Kiko Pangilinan and the National Youth Commission. 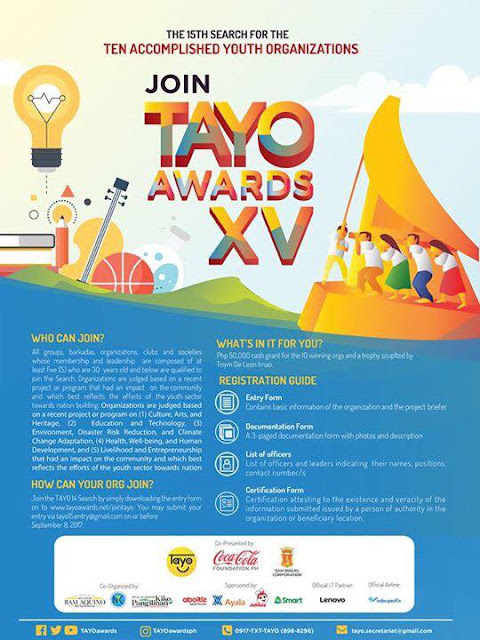 It is presented by Coca-Cola Foundation Philippines and San Miguel Corporation, sponsored by Ayala Corporation, Aboitiz Equity Ventures, Jollibee, Smart, our official I.T. partner, Lenovo Philippines, and Cebu Pacific, the official airline partner.